Bullied as a teen for being overweight, Bob Stone (Dwayne Johnson) shows up to his high school reunion looking fit and muscular. While there, he finds Calvin Joyner (Kevin Hart), a fast-talking accountant who misses his glory days as a popular athlete. Stone is now a lethal CIA agent who needs Calvin’s number skills to help him save the compromised U.S. spy satellite system. Together, the former classmates encounter shootouts, espionage and double-cross while trying to prevent worldwide chaos. Finally, I can watch Central Intelligence. I have to say that I am not disappointed at all. The film is opened with a touching opening scene that I nearly cried. Seriously, I am not lying about that. Dwayne Johnson played a different character than his usual role. Well, he is still full of action but now he added some ridiculous humour. It’s funny at some point. As for Kevin Hart, he is indeed a comedian. He nailed all the jokes. I laugh a lot when I watched Central Intelligence. 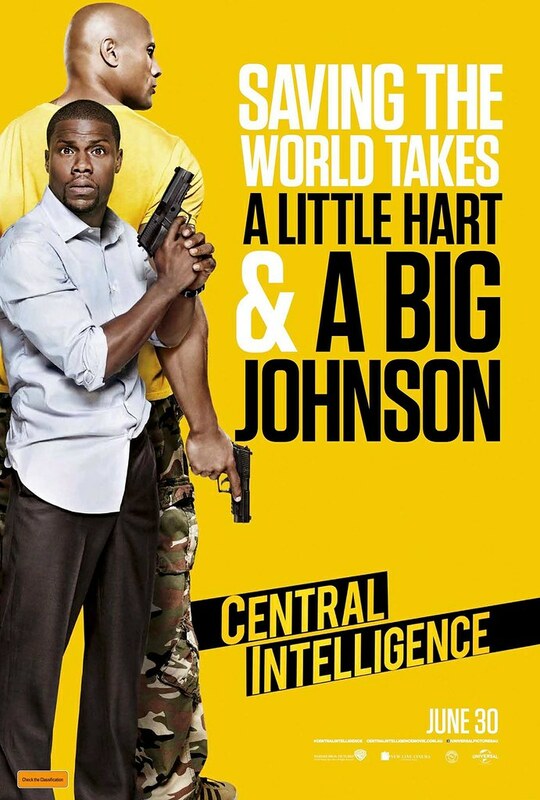 The humour and comedy that Central Intelligence provided, is not too much but not too little as well. The portion is good enough to make you enjoy the film, at least that’s how I felt. Aside from the humour and comedy, the actions and stunts are also great. The way Dwayne Johnson’s character, Bob, shot the gun and right on target was superb. I know it’s a special effect but if you don’t think it as an effect, it’s pretty cool. I think only Kevin Hart can make a fighting scene thrilling and funny at the same time. He is super funny. All the fighting scenes involving him is not just thrilling but also very funny. I can’t imagine other actors play the character of Calvin Joyner. He is the perfect actor to play the role. Bob Stone, who played by Dwayne Johnson, is also very funny and ridiculous. Seriously, Dwayne Johnson and Kevin Hart are the perfect combinations for a good joke. I have to praise Dwayne Johnson because he really succeeds in playing the audiences’ emotion. At least that’s how I felt. Sometimes I felt pity, sometimes I laughed at him, sometimes he made me curious and questions a lot. Dwayne Johnson’s expression was just awesome. You can just feel the feeling. I like the plot story of this film because I can’t predict the ending. I am pretty confused whether this character is good or bad, not because of their actions keep changing but more because of their mysteriousness. It’s smart and definitely made the audiences keep guessing and stay until the end of the film. However, I am a bit confused about the conflict. I don’t know if it’s because I kind of skip some talking or the real conflict is a bit blurry and not that exciting. Nevertheless, you need not to worry about the humour or the action because Central Intelligence has given us a good humour and action. You’ll definitely laugh when you watch this film. At least if you’re not laughing, you will smile. The plus point of Central Intelligence is the moral lesson they gave us. It’s about bullying. Bullying is a bad thing and that’s what they tried to tell us in the film. It’s a bad habit that needs to be erased. Not only they told us about the bad impact of bullying but they also told us how to face bullies. Bob Stone’s character has taught us so much about bullies. So yes, Central Intelligence is not only offering lots of laughs but also a lesson that needed to be taken and absorbed by everyone who has watched it. By the end of the day, it’s about the lesson that they tried to tell us. I think it’s great when a film is not just for entertain but can also teach the audiences a lesson. All in all, Central Intelligence is a film that you’ll definitely enjoy. I do enjoy it very much. I laugh a lot too. It offers a balance amount of comedy and action. Although the conflict, in my opinion, is not the best part. It’s not bad but it’s not the best part. You can also learn from the lesson that was given in Central Intelligence. This film is really entertaining. I give Central Intelligence 8.5 out of 10 stars.